My Great Grandfather (Charles F. Kieser) use to breed race horses. He owned Native Street. 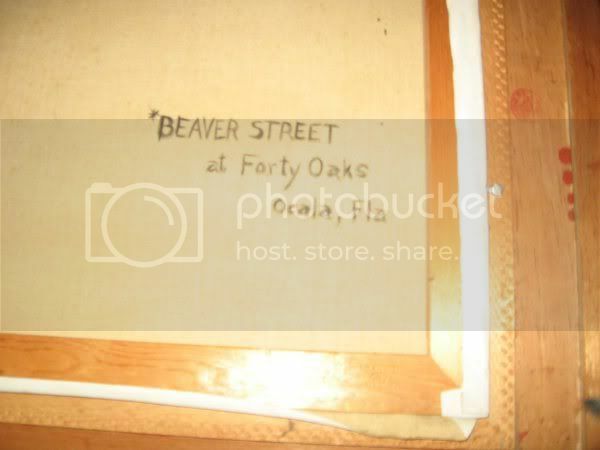 I just received an oil painting for Christmas that my sisters have always thought was a painting of Native Street, but written on the back of painting is Beaver Street* . My Mother, who is the only person who would know for certain which horse is in the painting, has Alzheimer's so I can't confirm with her. Last night I found an article in the NYT about when my Grandfather died, which says he sold Native Street for $40,000. I can't imagine why he would have a painting of Native Street's mother and not Native Street a big purse winner (at least back in those days) but I guess that's not so unusual. I'm trying to find out if anyone knows how I might find a picture of both Native Street and Beaver Street, which would help me discern identity in painting. Not that I'm selling, I'm also curious if the painting is of value. Unfortunately, there is no artist signature that I can find. Roguelet, please attache the photos of painting that I emailed you earlier, and the NYT article. When I click IMG above nothing happens. Well, it should be easy to tell for sure - if the horse is grey, it's Native Street. If not, it may well be of her dam, who was bay. 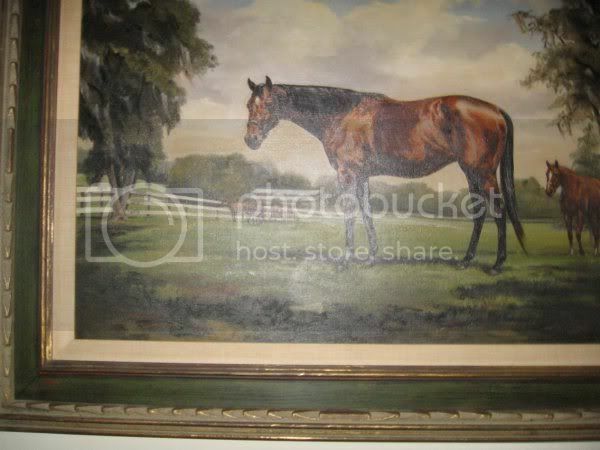 It's at all not unusual for a breeder to have a portrait of a prized broodmare. I'd certainly be curious to see it, if it can be posted here. Maybe one of our sharp-eyed members can ID the artist. Thanks Lucy. It must be a portrait of Beaver Street then because it's definitely not a grey horse. Roguelet said he would help me post the photo so I'm hopeful he/she will do that soon. Thanks for posting picture. Can you also post the back of painting with name on it. Regarding the .pdf, maybe open it, select text and paste into word doc first??? I'm still working on the article. Could it be by Richard Reeves? If one was rich enough to own Beaver Street and breed Native Street, one could afford the best equine artist of the day. If you have a film photo that you can send to Sotheby's they will do identifications for you for free. OT, but I love that female line for sport horses. A full TB of that line won the eventing bronze at the just past Olympics. Anyone know what the * asterisk signifies? It's pretty clear to me that the painting is of Beaver Street since the notation also gives the location. Due to the year (1950's) and the location (Ocala, FL) I believe it is HIGHLY likely it was painted by an artist from the large art colony in St Augustine, Florida at that time. You might send a high quality photograph of the entire painting to the Lightner Museum in St. Augustine to see if they can identify the artist. It's a similar style to Reeves, but he always signed his paintings quite clearly - with his full name, usually in the lower right-hand corner. Unless the frame is covering the signature, it would be easy to spot. March 25 - Charles F. Kieser, a retired vice president and director of the Borden Company and a breeder of race horses, died Saturday in a hospital here after a fall in his home. He was 77 years old. Mr. Kieser, who retired on April 1, 1956, joined Borden in 1936. Earlier he and his father organized Kasco Mills, Inc., a manufacturer of dairy, horse and poultry feeds. In 1930 he left Kasco to join Kraft Foods. He was born in Haverstraw, N.Y., and graduated from the Eastman College of Business in Poughkeepsie, N. Y. He owned the Forty Oaks Ranch at Ocala, where he bred thoroughbred horses. Three years ago he sold Native Street for $40,000. The 2-year-old filly won the Astoria Stakes at Aqueduct and the Sorority Stakes at Monmouth. He leaves his wife, Lee W.; a daughter, 2 step daughters, 3 brothers, a sister, 4 grandchildren and 15 great-grandchildren. It means that she was imported. Beaver Street was born in Ireland. That was the old way of denoting an imported horse - nowadays, they just put a country code after the name, ie, "Beaver Street (IRE)". It just so happens that the Antique Roadshow is going to be in San Diego this coming June 12th. I applied in their drawing for tickets to this show and was selected, so I am going to be bringing my painting of Beaver Street to see if anyone there can identify the artist. Not all items reviewed by the Antique Roadshow professionals get selected to be on TV, so not certain that Beaver Street will make it to live TV but I will be sure to post what they have to say about my painting, and hopefully the artist name, regardless. Any updates on your painting? Breeder of thoroughbreds for sport. There's a posting about Native Street with photos ups on the TVG.com website. There is a community forum that says discussion, and it is in the History and photos group. Just showed up in the last couple of days. I'm sure they would love to have a good clear image of Beaver Street to add to the info.